shop.studiovitruvio.it accepts payments by: Credit Card, PayPal, Bank Transfer. You can choose among these instruments at the end of the purchasing order’s process. All payments will be carried out in favour of Vitruvio S.r.l..
You can use credit cards that operate on the circuits: Visa, Visa Electron, Mastercard, Maestro, Discover, American Express, Aura. You will be addressed to the page of the website address of the bank that is the holder or runs the service of payment on-line , to which you have to provide the data of your credit card by means of protected connection against unauthorized access, through cryptographic transfer of SSL data ( Secure Socket Layer) at 128 bit. Such data are not accessible to third parties, not even to Vitruvio S.r.l.. Upon receipt of the debiting authorization from the company issuing the credit card used by you, Vitruvio S.r.l. will ship the purchased products. PayPal allows each company or consumer who has an e-mail address to send and receive payments in a safe way. The use of PayPal is free of charge. 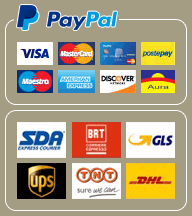 Following the link “Pay with PayPal” you will enter PayPal safe site. Putting in your credit card data (even a prepaid type, like PostePay) you can make payment to Vitruvio S.r.l.. Registration is not required to “PayPal” You can also use your bank current account to feed the PayPal account from which you are going to carry out payments. Vitruvio S.r.l. will ship the purchased products as soon as it receives the authorization for payment. You can pay for your purchases by bank transfer, too. Make your bank transfer by using Vitruvio S.r.l. bank details reported here below and specifying in the reason for transfer the purchasing order’s number Both the number of the purchasing order and the bank details will be reported in the purchasing order’s confirmation you will receive by e-mail. Vitruvio S.r.l. will ship the purchased products as soon as it receives the confirmation of payment.